Cricket is something I am enjoying and playing since my very early days of childhood. My fellow cricketers call me thinking cricketer :), you fill find out why once you read the rest of the post. Being a cricket lover, I learned following things for business management from cricket in particular and sports in general. Cricket requires lots of preparation before the match for bowling,batting & fielding. Preparation is the key for a good performance in any match. Similarly before starting any business you must be well prepared to be successful. When you are a kid “rules” really ……, I guess this is why teachers try to use different situations particularly they try to play sports with kids to teach them rules. 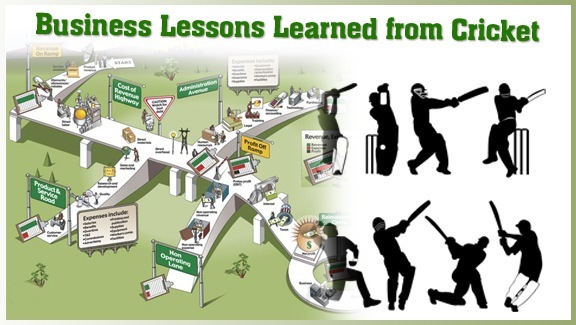 I learned many golden rules from game of Cricket which helped me to understand the importance of rules in any field of life particularly business. In business most of the times goodwill plays an important part to take a an average business to a successful one. To me no rules no business. So many times you paid the penalty being not disciplined e.g. shocking wrong parking ticket. No ball: You get penalised if you cross the bowling line while bowling and you have to go back and do an extra ball. What is your own take on this? There is always a limited time available in cricket to accomplish your target. You can’t go fore ever to get your target. On time delivery of orders is so crucial to survive in business because most of the time you get paid only if you deliver on time. When you don’t deliver on time, you put your business on a high risk of failure. You will face different situation in every cricket match. Key to win the game is to plan and prepare for each and every situation. And you should be ready to play in every condition. Because you can’t say that you did not face these conditions before, this is why you are not going to play. I don’t think so you will get such an option during the match. Regardless of the conditions you have to play and most importantly perform to win the game. Similarly when it comes to business every customer you face, every contract you apply or every order you get would be different and you should be ready and train to handle. You can win the match here and there but to win the world cup or stay on the top ranking you require to win consistently as a team. For truly successful business you have to deliver more than customer executions on a consistent basis. Very common term for any batsman in the cricket and it really works. the wicket for longer periods. Similarly in business, if you are good at what you do then it is the matter of time, the longer you can stay in business the more successful you will be. 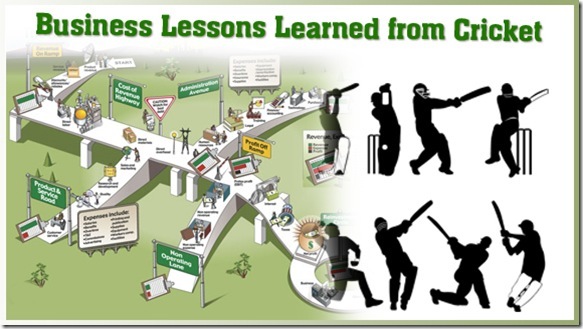 Cricket helped me a lot to learn how to handle and manage pressure. Those players who know the art of pressure handling always perform well and helped their teams to win. Big players always deliver under pressure situations. All business people know types of pressures they have to manage on a daily basis like delivering on time, paying the suppliers, checking the staff and list goes on and on. Can you be successful without handling pressure well? I seriously doubt it. Life is a race and if you don’t run fast competition will leave you back. To keep your place in the playing eleven you always have to compete by performing well consistently. Business environment is getting harder and harder on a daily basis. Therefore, be ready to compete. Go buy a lottery if you are after easy success! Being a Virgo I am kind a perfectionist and believe that you always needs specialist for each job. All rounders are good to support specialists but they can’t win matches for you regularly. Match winners are mostly specialist batsmen or bowlers. Similarly for a truly successful business you need specialist qualified people for key positions. Cricket is a team game. All the players support each other to win the match. If not ask in the comments section at the end of this post. I can guarantee the failure if you don’t enjoy what you do. The more you enjoy the more you do well in field of life. This is the golden business rule I learned from cricket. Business is a challenging and equally rewarding thing and if you are not enjoying it then you should seriously consider your options. This is a fascinating thing for me when I see a super star bringing the drinks and towels for his junior team members. Similarly in business humbleness goes a long way. Teams who keep backup of all their key players always remain strong regardless of injury to a player or when players retires. Successful businesses should be built around strong systems and do not rely on an individual. No matter how talented batsman you are, you will struggle to achieve big success if you don’t know how to manage and build your inning step by step ball by ball. Similarly business is not a T20 match, you can compare business with test match and require strong character and stamina. Great batsmen plays to their strengths which means they normally don’t try new things during match at least before they score a hundred or match situation requires. Here is million dollar tip! Start strong and try to create one best product or service first before trying new shorts. Once you have customers for your best product then you can cross sell anything, literally anything. This skill really helps you when you are chasing any score to win. You plan over by over to achieve the target, you keep an eye on the run rate so that target should not go beyond your reach. Because you cannot score 250 to 300 runs in one over, only way is to do over by over on a 5 to 6 runs per over, which is to be honest very easy and achievable. It becomes monster like your school home work, university dissertation if you left it till the last moment. Business lesson here is to set small daily targets to achieve big results in a year, three year or five years time. So many business people ignore this crucial point. But any sports person can understand the importance of fitness. To me run a successful business you need a fitness like a professional sports person. Please take care of yourself and your health and don’t ignore this. Make thirty minutes of exercise your daily routine, if it is too much chunk it down to three session of ten minutes each. Never relax until you win. As a Cricketer I don’t accept defeat until the game finish regardless of the match situation, you fight till the last ball. You should keep on top of your business all the time, because one mistake can change the whole business. Don’t get me wrong, I am not saying you should not take risks because more risks more business. So often you see in cricket matches that single run can make huge difference and you could end up on the other side what you expected. In business you should keep your eyes open for opportunities, single opportunity can take you from a struggling business to a successful one. Key here is to keep your eyes open and be ready to grab the big opportunities in which come towards your way. This is a common sense and I don’t need to go into details, whether its Cricket or business always use proper protection. Relax, work hard and follow your plan to achieve your goals. If you over try, it will make difficult for you to achieve your goals. Positive body language plays big rule in winning the Cricket match. This is what your opposition watch to read your mind. Regardless of the match situation, if your body language is positive you can come back from any worst situation. In business your customers, your suppliers or any one you come in contact with judge the way you talk, move and behave in different situations. You cannot achieve with money what you can with passion. To become a top Cricketer or businessman Passion is absolutely vital. You should always have plan A and B, simply because things don’t go always as planned. You should be ready to deal any situation that will appear during actual match or real business environment. You even don’t have to do mistake yourself, you can learn mistakes done by your seniors. Leadership is the most important ingredient of success. So many time I saw teams winning because of great leadership. Strong leadership can take an average business to a successful one. Any Cricketer in business or business person in Cricket? Can you relate any thing in this post?Would love to discuss your experiences in the comments sections below.